Rep. Martin Lalonde (D-South Burlington), left, talks Tuesday about his proposal to ban teacher strikes. To his right are Reps. Kurt Wright (R-Burlington) and Kevin Christie (D-Hartford). In the middle of a five-day teacher strike at the height of campaign season, Gov. Peter Shumlin declared last October that Vermont should prohibit teacher strikes. But on the eve of a House vote to do just that, Shumlin is staying mostly mum. Whether a bill will ever reach his desk is unclear. The House appears divided as members head into a vote Wednesday to decide whether prohibit teachers from striking and school boards from imposing contracts as of July 2016. Some Democrats, seeking to defang the bill, intend to introduce an amendment turning it into a study. “It’s going to be close,” said Rep. Tom Stevens (D-Waterbury), who opposes ending the right to strike, arguing that removing that right shifts the balance of power to school boards. House Democrats don’t have an official position on the bill, said House Majority Leader Sarah Copeland Hanzas (D-Bradford). “We all come from communities with lingering scars from strikes or impositions,” she said. A half-dozen Democrats and Republicans spoke out in favor of the proposal during a press conference Tuesday at the Statehouse, with support from the Vermont School Boards Association and Vermont Superintendents Association. Other Democrats and the Vermont National Education Association teachers' union, meanwhile, were working behind the scenes to derail the bill. Among the supporters was Rep. Martin Lalonde (D-South Burlington), who serves on the South Burlington school board and weathered last fall’s teacher strike. Lalonde is the lead sponsor of an amended version of a bill that was originally introduced by Rep. Kurt Wright (R-Burlington). Lalonde said he initially came away from the five-day strike thinking it wasn’t so bad from the school board’s point of view, as the strike brought an end to the contract stalemate. Four years ago, the South Burlington school board imposed a contract on teachers, Lalonde said, and he found that process just as divisive. Stevens said banning strikes leaves teacher contract negotiators with no leverage to reach a resolution. 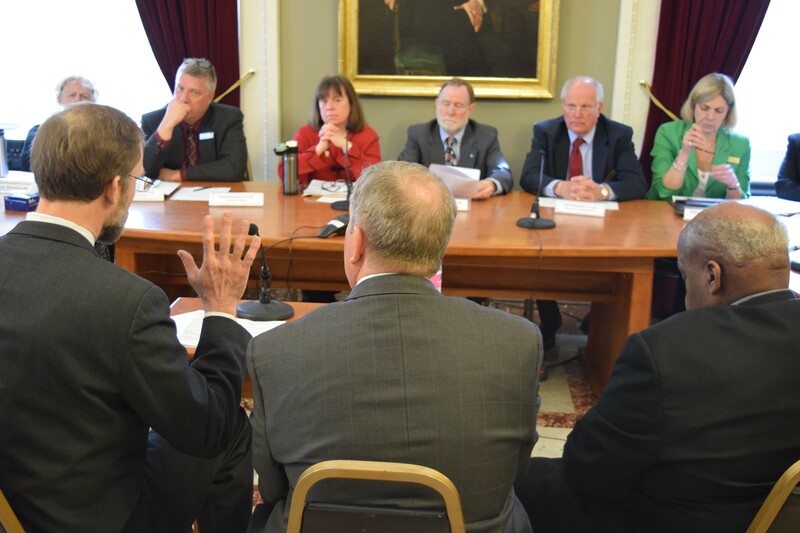 A previous version of the bill would have given that role to the Vermont Labor Relations Board, but the amended version calls for a study group to figure out what to do if the two sides can’t reach agreement.